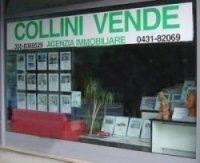 Collini's Real Estate Agency is situated near the free beach of Grado, called "blue coast". Specialized in sales and rents of business building in region, the agency, during the last few years, has been interested to the sale of apartments, villas, hotel in the famous tourist locality. Our staff can give legal, financial and fiscal aid from sale or rent to notarial deed. The agency, through Fiaip and Fima, is operating with the most important credit institutions and can address the customers to the more convenient loan. The agency has apartments for all the requirements and can satisfy every request.